Does L.A.’s Deal with CBS/Decaux Make Bike Nation’s Plans D.O.A. While New York City is enjoying the successful launch of CitiBike, the nation’s largest bike share system, Los Angeles is still waiting for Bike Nation to begin installation of the 4,000 bike bike share system it promised at the April 2012 CicLAvia. The system was supposed to begin operation last winter, and then last April, but there is still no announcement for when the system will begin operation. None of Bike Nation's renders or examples have advertising, so we're cool...right? While the world laughs at the over the top, and really really over the top, media coverage of CitiBike, news reports on the West Coast have been more subdued about Bike Nation. In fact, the only recent coverage in a mainstream publication is an editorial in today’s Daily News, which admits that it doesn’t know much about CitiBike, bike share or Bike Nation. But while we wait for news from Bike Nation, advocacy website Bikeshare.com published a piece today that offers one explanation for the delay: the advertising model that Bike Nation is counting on is not allowed in the city’s ordinance allowing bike share kiosks. In short, the ordinance disallows advertising on the kiosks that will hold the Bike Nation bikes. While Bike Nation refuses to give the specific numbers for its business model, it has stated that kiosk advertising was one of a few revenue streams that it is counting on. No excavation or damage to the Public Right of Way and no permanent structures are allowed to be installed. No advertising is allowed on non-moving property in the Public Right of Way. This means no street furniture-like advertising is allowed on the kiosks. Advertising on bikes is required to be painted or decaled on the body of the bike. Officials with the city and with Bike Nation have yet to comment on the story, or what the ordinance means for bike sharing in Los Angeles. Complicating issues, changing the advertising ban on kiosks is not as easy as just changing the words in a motion. Los Angeles signed a Street Furniture Contract in 2001 with CBS/Decaux allowing the advertising giant the exclusive right to advertise in the public right of way. Whether Bike Nation didn’t fully understand the contract, or thought they would be able to get around it, is not known. However, the officials with City Planning that drafted the ordinance obviously disagreed. One city staffer, speaking on background because he is not a spokes person, holds up the bike share ordinance as a model for permitting bike share kiosks that is open to all vendors, is consistent with the City’s contractual obligations with CBS/Decaux. While initial press reports of the deal between Bike Nation and the City focused on a non-existent “exclusive” deal between Los Angeles and Bike Nation, it should now be clear what Streetsblog initially reported is true. There is no exclusive deal. If another company can do a better job than Bike Nation, the opportunity is there. 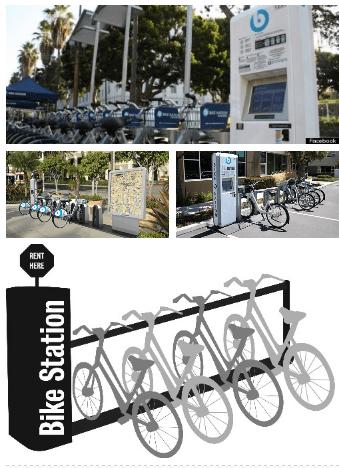 Whether or not Bike Nation can make bike share work in Southern California based soley on advertising has been a hot topic of debate on Streetsblog and among advocates across America. Whether they can do it without advertising revenue from kiosks seems a long shot, unless they can replicate what New York and Alta Bike Share accomplished in New York: find a major investor willing to underwrite the entire system. AEGBikes, anyone? It’s sort of the exact opposite of OccupyBikes. The difference between the Bike Nation system and DC’s first ClearChannel-initiated system will be that the Bike Nation system will never actually be put in the ground. In a few years, it will mostly be seen as a distraction on a way to a publicly-subsidized system from a provider with experience in other cities. Transportation cap and trade revenues start paying off in 2015 – I think bike share would be a good use of funds. This is sort of bike share 101. Thats the first thing you can look at because almost every major city has this type of deal. Most of the bicycle sharing systems are following the model of a successful operation that Velib in Paris provides. That includes user fees that are much lower than capital and operating costs. The difference is made up through government subsidies, sponsorship, or kiosk advertising. The first company that created a large bike sharing system based on this idea was Clear Channel in Europe. There already was street furniture in the form of bus benches and bus shelters offered for free to cities worldwide in exchange for the ability to advertise. So in Clear Channels view they were offering another form of street furniture in exchange for advertising. Citibike has what is considered very high user fees compared to most bicycle sharing systems at $9.95 for 24 hour use and a $95 annual membership. When Alta Bicycle Share signed the contract with New York City they did not know how they would be able to expand the agreed to 10,000 bike system with the amount of money coming from sponsorship and expected user fees. The capital and operating costs would make expansion a losing proposition without some other supplemental revenue source such as added services fees to the users. Ridiculous that this is coming out now and was never brought up between the city and Bike Nation. This is for the better. LA needs a real bike share company (one with experience) and not a first-timer like Bike Nation. It is going to be up to Santa Monica to lay the groundwork now.